In order to have long hair, you need to keep it healthy. There are several products that claim to give you long and healthy hair, but not all of them are effective. You can take a healthy diet and include some natural products in your daily diet to improve the growth of your hair.Also, instead of running for cosmetic treatments and chemicals, you can include important vitamins in your food to improve the growth of your hair. Vitamin E is one such vitamin that is known for its positive effects on your hair and even skin. The role of vitamin E in attaining healthy hair is well established and so many shampoos and conditioners have this vitamin as their essential ingredient. Vitamin E not only makes your hair long, but also strong and gives it a healthy shine. Vitamin E boosts the circulation of blood in your body. It is especially effective in improving the blood circulation in your scalp. With improved circulation, the cells of your scalp and hair follicles get more of oxygen. This oxygen is used by the cells to produce energy and so, the growth of your hair improves. With improved circulation, essential nutrients also reach the hair follicles in sufficient quantities and so, your hair becomes healthy. This also leads to increased growth of your hair and reduced hair fall. Studies have shown that vitamin E supplements can even reverse the process of male baldness. This means that regular intake of vitamin E and a regular massage with oil containing this vitamin can even reverse the progress of baldness in men. Vitamin E enhances your immune system, thereby preventing hair from any external damage. In coordination with selenium, a mineral found in our body, vitamin E also defends your hair follicles against any kind of attack, thereby making them strong. When the hair follicles are strong and free from damage, they grow rapidly and so, you can get your desire length of hair within a short period of time. 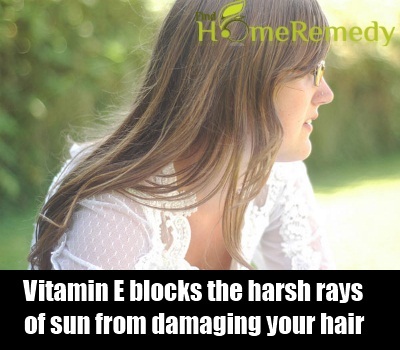 Vitamin E blocks the harsh rays of sun from damaging your hair. When your hair is protected from Ultra Violet rays of sun, it remains moisturized and does not lose its nutrients. This helps in the growth of your hair and makes it stronger. 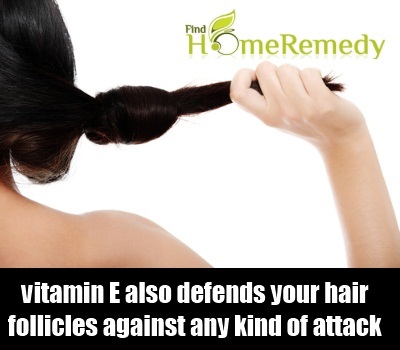 Vitamin E also keeps the hair free from external damage and makes it healthy. Vitamin E shows strong antioxidant properties, which are helpful in reducing the oxidative stress created by free radicals. 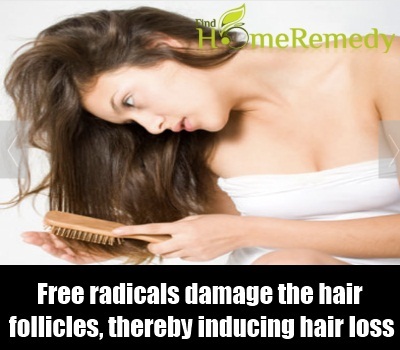 Free radicals damage the hair follicles, thereby inducing hair loss. Vitamin E destroys these free radicals, and so, creates a healthy atmosphere for hair to grow. With strong follicles, the rate of growth of hair increases and it also becomes strong. 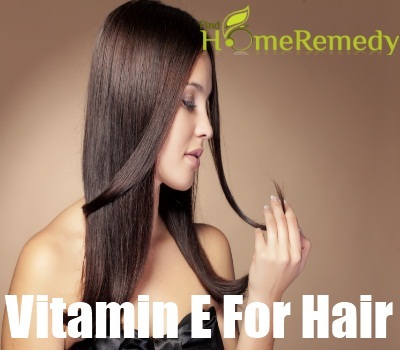 If you want your hair to grow at an increased speed and also remain healthy, then you can take vitamin E supplements. For an average individual, the optimum dosage of this vitamin is 400 IU per day. A slight increase in this dosage won’t have much significant impacts, but as it gets around 1000, it may have adverse effects. 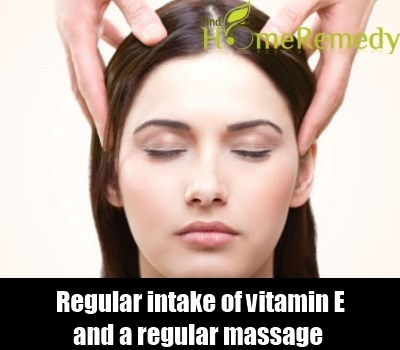 Some people exceed their dosage of vitamin E to get considerable results in short span of time. In such cases, if you take a daily dose of 10000 IU of vitamin E daily, continuously for some time, you may even start losing your hair. 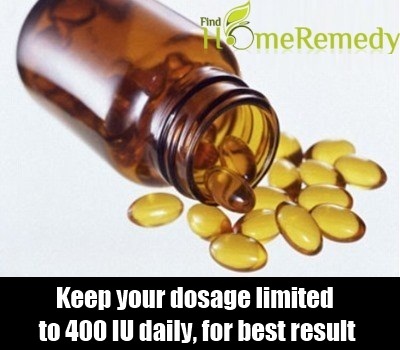 So, try to keep your dosage limited to 400 IU daily, for best results. 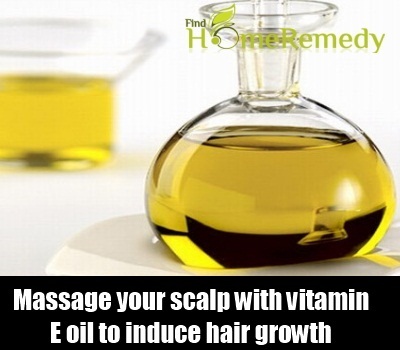 You can massage your scalp with vitamin E oil to induce hair growth. For this, take massage oil that suits your hair, i.e. carrot oil if your hair is dry, sesame oil if you have oily hair and grape-seed oil if your hair is normal. Add to this, contents of two vitamin E capsules, by piercing and then squeezing them. Massage this on your scalp for 10 minutes for best results. 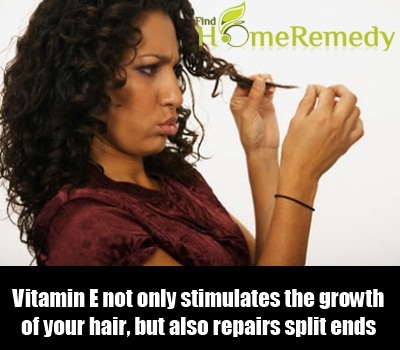 Vitamin E not only stimulates the growth of your hair, but also repairs split ends. It also prevents premature graying of hair and reduces dryness of the hair. It repairs all kinds of damaged hair and gives it a healthy, shiny and complete look. Vitamin E can be found in abundance in fresh fruits and green leafy vegetables. You will find this vitamin in spinach, wheat germ oil, eggs, cereals, soybeans, nuts, grains, and vegetable oils. 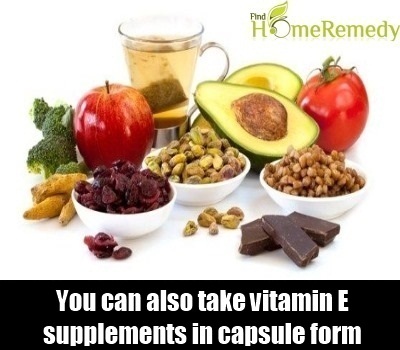 Some people, especially those who are facing the problem of a receding hairline, can also take vitamin E supplements in capsule form. This entry was posted in Featured, Vitamins Remedy.